Should I Eat a Raw Bell Pepper? Bell peppers are a staple in most grocery store produce sections. You may have had bell peppers roasted, steamed or added to a stir-fry. But you don't have to cook bell peppers to reap their health benefits and bright, slightly tangy flavor. Red peppers in various colors and varieties add brightness to a raw vegetable tray, pair well with salads and can be eaten on their own for a satisfying snack. When you see row upon row of colorful bell peppers at the grocery store, you may notice various price points depending on the color and availability. 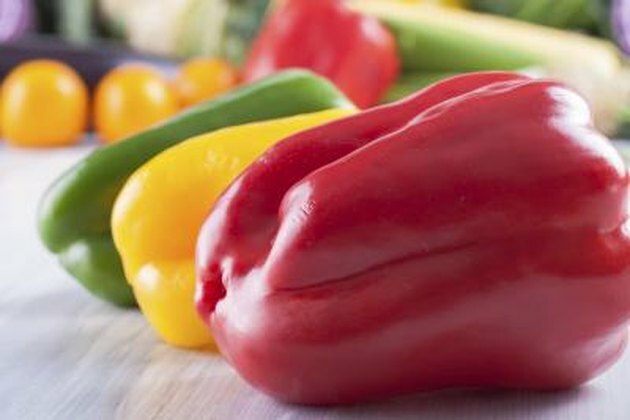 It's a common misconception that green, red, yellow and orange peppers are different vegetables. In fact, they are all the same type of pepper, only left to ripen to different stages. Green peppers are the youngest type and often the most abundantly available. Yellow, orange and red peppers are the same vegetable, but they are more ripe and often sweeter. No matter which color of bell pepper you choose, they all have a similar flavor. Unlike their cousin, the jalapeno pepper, bell peppers are mild in taste. A green pepper tastes the most tangy, while the sweetness increases the further a pepper has ripened, with red being the sweetest variety of all. Bell peppers are generally crispy, with a that pairs well with pastas, other vegetables and meats. If you don't like the heat of spicier peppers, bell peppers can give you the texture and flavor without the spiciness. Bell peppers are as tasty as they are nutritious. A typical green bell pepper is only 33 calories and just over 7 g carbs. A red bell pepper has 140 mg of vitamin C and 4218 IU vitamin A, making it an immunity system powerhouse. The best part about eating bell peppers raw is that you don't lose any of the essential and beneficial nutrients during the cooking process. Of course, adding dressings and oils to the peppers will increase the calorie and fat content. While the seeds inside a bell pepper are edible, they have a slightly bitter taste that some may find unpleasant. To prepare a raw bell pepper, wash the skin well with water and dry it with a clean paper towel. Slice the pepper in half and twist out the stem and seeds. The ribs inside the pepper can also be bitter, so cut those out as well. Slice the pepper for snacking or dipping, or chop the pepper to add to a crunchy Cobb salad for lunch.